In June 2007, the homophobic violence and rhetoric in Russia was so deplorable gay activists, myself among them, in New York City and San Francisco launched a boycott against Stolichnaya vodka. We poured the liquor down the sewer in front of the Russian consulates and generated a fair amount of attention. Since then the Russian government has enacted draconian anti-gay laws and LGBT citizens continue to be attacked at Pride marches or just for being out and proud on the streets. In the past month, with an escalation of violence targeting LGBT Russians and laws against gays being used to arrest native-born and foreign queers, activists worldwide have launched a new boycott of Stoli, a debate is underway about boycotting the 2014 Olympics in Sochi, Russia, and protests are planned against at the consulates in New York City and San Francisco this week. 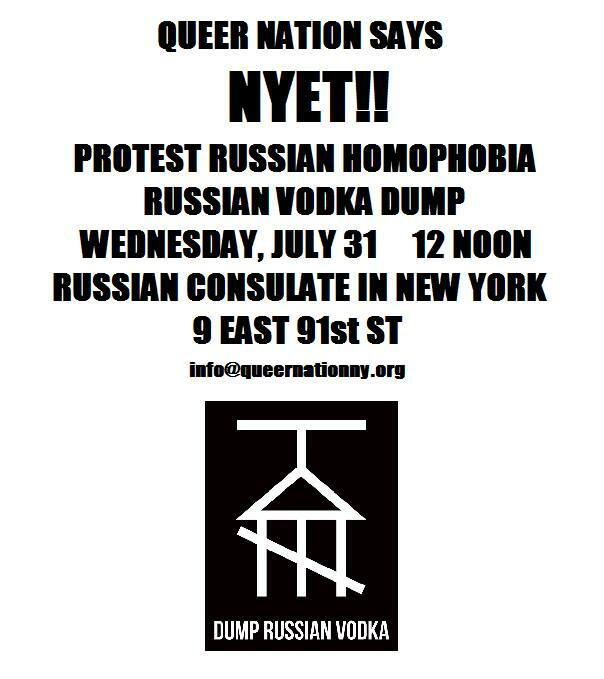 If you're in Manhattan tomorrow, Wednesday, July 31, please join Queer Nation and RUSA LGBT at 12:00 pm (noon) at the Russian consulate located at 9 East 91st Street. Full disclaimer: My employer, GayCities, is currently spearheading a multifaceted digital campaign and live event series with SPI-owned Stoli. From working personally with them I can tell you SPI cares about the gay community. Over the years, [a local gay SPI sales rep] has secured more than a million dollars worth of Stoli sponsorships for LGBT nonprofits, including the Castro Street Fair, Richmond-Ermet AIDS Foundation, GLAAD, Sisters of Perpetual Indulgence, Harvey Milk Foundation, AIDS LifeCycle and HRC. Why are we so easily persuaded to start stabbing our own allies? My fear is that Stoli will be turned off by the whole situation. It will stop employing people like [their gay sales rep], stop providing incentives to bars like Beatbox, stop spending money to put an ad in the Bay Area Reporter, stop partnering with GayCities and stop helping pride celebrations around the world break even. Oh, heaven's to Betsy! That sales rep would have a heckuva lawsuit if he were fired over the actions of protesters, BeatBox would simply have to find another vodka company for drink specials, the millionaire publisher of the BAR would have a few less bucks and gay Pride events would be free of a small part of the corporate colonization of Pride Marches. Many of the comments at the Examiner page for Raymundo's nonsense are critical of him and his shilling in the newspaper for Stoli, which pleases me. Boycott Stoli! Solidarity with Russian LGBT people! The good work they claim is done as marketing 101 - all selling the product.